We got started by working in restaurants/catering companies which weren't giving their customers a real mexican food experince and cheating them out not only in their pockets but in the poor quality of food they were providing. We decided to take action and be honest and caring to our clients by taking our time to prepare them great mexican food. 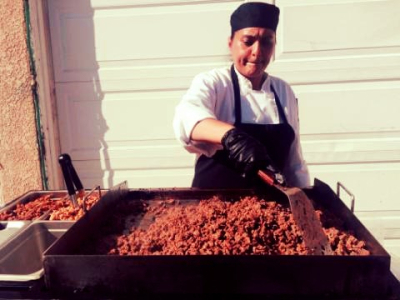 Food is a very delicate matter in which it has to be handled with care, which is our goal every day here at Rancho's Onsite Tacos. Over a two years we have made many of our clients beyond happy with our food and service. Although we are new we keep our traditional reciepes alive from fresh ingredients nothing we make come from can preservatives. We have many clients that can give a testimony about our service and food. Challenges are accepted everytime, we have a well trained staff to accomidate any amount of guest our clients might have, it gives our staff more knowledge to grow on. Thank you and look forward to serving your taco needs!